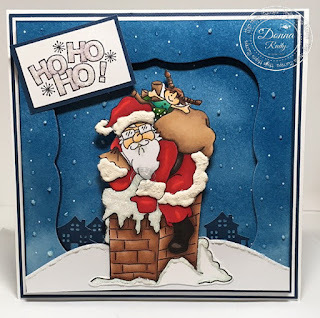 I have one last Christmas in July post to share with you. Today's card features "Santa Bob" from High Hopes Rubber Stamps. 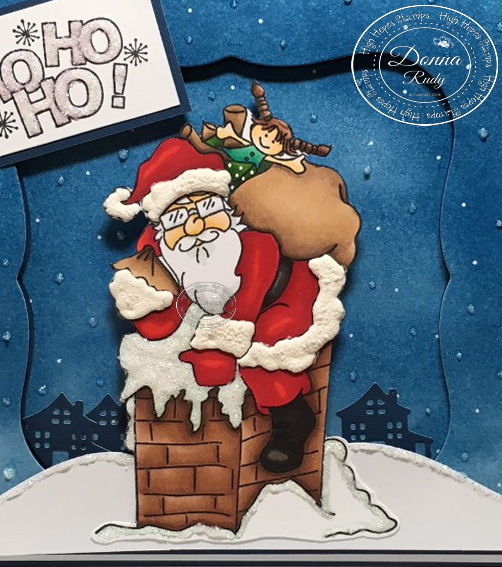 No Christmas card making endeavour is complete in my world without making at least one Santa card! Santa Bob fits that bill perfectly doesn't he? Going down the chimney with his bag of toys and cool shades - we will see if he fits! After colouring my stamp with alcohol markers and pencil I added some liquid applique to his coat and had trim. I wasn't going to fussy cut him but as you can see not all things go as planned! I created my background with distress ink, a white gel pen and some glitter accents. At first I wasn't happy with my falling "snow" so I was going to scrap it but then I remembered no two snowflakes are alike so they don't have to be perfect. Next I took my label die, cut out the centre and added some die cut houses. I kept the frame and added some snow drifts to the bottom and added it to my cardstock base with foam pop dots. I finished it off by simply stamping and adding my sentiment which is glittered up to match. I'm in awe...... this card is absolutely stunning! I love that background and those snowflakes! Santa Bob just pops off your design! All around perfection for your last Christmas in July card! !